The members of the society of Naural History and of Mycology of Saône et Loire and also its president of the time Dr Gilbert Durand. 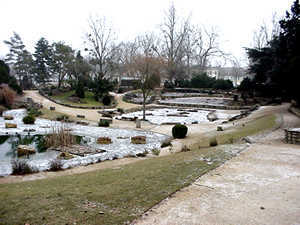 The Department of the parks o the city of Calon-sur-Saône from 1959 to 1981, and from 191 until today. On this area of embankment, on the 22 of March 1951, a cedar from Liban was planted in the presence of the Mayor of the time Mr Georges Nouelle. Then the idea ”a plant in its environment” by the eminent botanist Emile Chateau made possible the creation of a little lively geography of vegetable kingdom since 1957, closely linked to the mineral kingdom. This idea guided all the partners to the action of geo-botanic. It was entirely realized by the technical department of the city of Chalon-sur-Saône. The rocks and the lands were brought from he represented regions. Today, this garden is composed of 600 species and varieties, it shows 8 regional scenery : the water, the limestone Côte chalonnaise and its vineyard, the granite Morvan, the marais Bressan, the Pinède, the Provence, the aromatic and medicinal plants, Rocflor and its garden of perennial. From 1/10 to 31/03 : 8 am - 5 pm. From 1/04 to 30/09 : 8 am - 10 pm.